Installs every two-piece ear tag we sell. 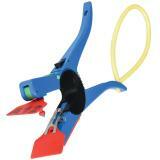 We applied our Q-flex tags to our ewe flock with this tagger and were impressed. 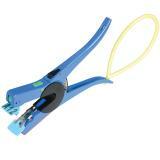 A popular applicator from Australia with farmer-requested design features. Unable to view the files? A PDF viewer is required for viewing and printing. Click the icon below to download the FREE Adobe Reader. 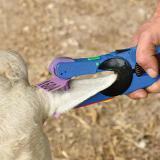 To apply Q-flex®, MiniTag and 7X ear tags to sheep, goats and cattle. 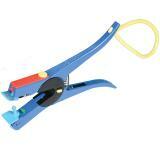 Wrist lanyard keeps the applicator in your hand if a tag does not release. It also offers a convenient way to carry the applicator without setting it down and forgetting its location (something we’ve done all too often). Male pin pivots only after the handles are fully closed or fully open. Releasing only when a tag is correctly applied. Sliding lower jaw with quick release by pushes the female tag out after application. 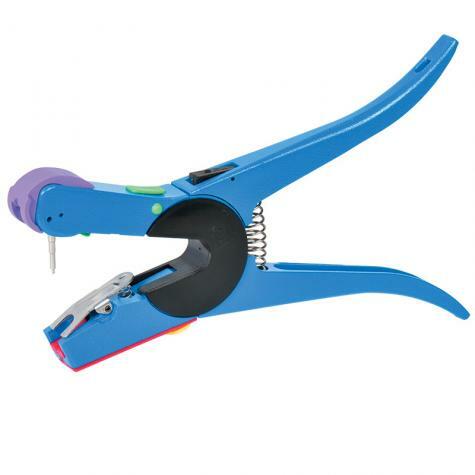 Tagger can be adjusted to accommodate slightly thicker-than-normal tags by adjusting the applicator restrictor (yellow switch on side of tagger). Push-out for easier handling of the thicker tags. Tagger can be locked into the closed position for storage. Tag placement is critical to success! For maximum retention and the lowest risk of bleeding and infection, place ear tags in either of the two spots shown in the illustration below. The goal is about 2-3 inches from the head of the animal. Plastic tags (all brands) are much easier to install if they are warm. Why? As the temperature drops below freezing, plastic becomes less flexible (more stiff). Forcing the male point of a tag through the female takes many more lbs. of pressure (because the female must expand). So if you care about your hands it’s a good idea to keep the tags above freezing in very cold weather. It takes very little to do this. One method is to simply store them while tagging in a small bucket, cardboard box or tool box with a lid alongside a sealed pop bottle full of warm water. The warm water will keep both the air and the tags warmer in the container. Excellent ear tag for adult rams and ewes. Readable by most. Not too heavy for an adult animal's ears. Largest ear tag in our Q-flex line—very easy to read. For adult sheep only. 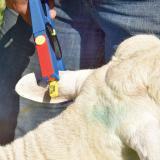 Easy to read ear tag used for lambs, goats and small sheep breeds. Small temporary tag for lambs and kids. Useful for quick stock identification on the farm. Reliable long-term tag. Preferred for goats and small sheep breeds. Large readable cattle tags. Differ from many US cattle tags because the male is not a button. The tag is a double-panel so it is readable front or back. 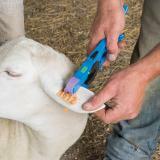 An easy to use applicator for applying Q-flex, Mini and 7X ear tags to sheep, goats and cattle. The pivoting male pin, reduces ripped ears. An all-purpose antiseptic OB lubricant for lambing and kidding. Very useful if a lamb (or kid) goes dry during birth. Our go-to spray for fly control and prevention. We keep a few cans in the barn at all times in case of fly-stuck and other fly related issues. Cover wounds on sheep, goats and guardian dogs to repel flies and biting insects. Effective for several days after application. Recommended: 0 out of 1 said they would recommend this product to a friend. 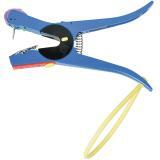 I bought this applicator because the description said it works with all two part eat tags. I bought the mini scrapie ear tags. This applicator does NOT work with the mini tags! 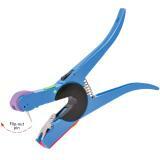 The applicator pin is too narrow for the tag and wants to fall off just when you try to put it on the ear. I had to use my old applicator (free from scrapie program). It worked fine, so this proxy was a total waste of money. We will notify you as soon as the item is available. is temporarily out-of-stockcoming soon. We can notify you as soon as this item becomes available. Please enter your email address below.